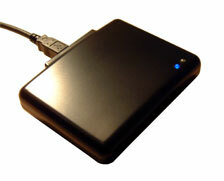 Infinity USB is connected to and powersupplied by a USB (Universal Serial Bus) port. Just one standard A-B USB-cable is needed (no need for an additional DC-adaptor). When not in use, Infinity USB enters a powerdown state using only 0.06 Watt (0.5kWh/year). Infinity USB programs most popular smartcards on the market. For a complete list of all supported smartcards, please see the product-matrix. Infinity USB is based on a 24MHz RISC processor, and has some of the fastest programming times of any programmer on the market. Software runs under Windows 98, Windows 2000, Windows ME, Windows XP and Windows XP64. Or even better, download the software from the download page and try it out before buying! What other thinks? Infinity USB has been independently reviewed by www.duwgati.com, find the review here. For a short walk-through of the software by Duwgati, click here.